Exercise boosts brain power and enhances the capacity for learning. This occurs because “Physical activity presents a physiological stress to the brain that, when balanced with recovery, promotes adaptation and growth, preserves brain function, and enables the brain to respond to future challenges” (Sattelmair & Ratey, 2009). These effects not only enhance learning and memory among younger people, but also slow age-related cognitive decline for older individuals. A study of 766 women aged 70-81 found that the risk of cognitive impairment was 20% lower among the most active subgroup (Sport Information Resource Centre, 2009). The cognitive benefits of exercise can even occur in utero. Experiments have shown that when female rats are more active while pregnant, their pups are born with 40% more cells in their hippocampi. A Finnish study of 3,403 individuals 25-64 years of age found that subjects who exercised at a moderate level two or three times a week felt significantly less sadness, distrust, stress, and anger than participants who exercised little or not at all. Individuals suffering from severe depression achieved significant improvements after engaging in an aerobics program. Benefits were similar to those of antidepressant medications, and individuals with a higher aerobic exercise capacity were less likely to suffer relapses than those taking medication. Researchers divided 156 women aged 50 and up with serious depressive disorders into three groups: antidepressant medication only, exercise only (30 minutes three times per week at 70-85% of maximum heart rate), and both medication and exercise. After four months, all three groups achieved a significant reduction in depressive symptoms, but when researchers evaluated the groups six months later, those who were still exercising had been less likely to suffer relapses. A study of 4,500 teenagers found that participants who engaged in increased physical exercise (undertaken as a leisure activity) suffered fewer depressive symptoms over the course of two years than their less-active peers. Older people who engaged in resistance (strength) training several times a week for 24 weeks experienced significant improvements in overall mood and reduced tension, anger, and confusion. In this era of accountability demands, many schools are reducing time spent on physical education in order to concentrate on increasing standardized test scores in math, reading, and other key subjects. However, this may be the wrong approach, given the growing body of evidence that exercise produces significant cognitive benefits which can translate into improved performance on standardized tests. Sigfusdottir (2007) found that body mass index and physical activity were responsible for as much as 24% of all differences in academic achievement. Dwyer et al’s (2001) evaluation of nearly 1 million students in grades 5 through 9 found that those with higher levels of physical fitness (particularly aerobic capacity) achieved higher scores on standardized tests (this effect was strongest for mathematics tests). Shepherd (1997) found that reducing academic class time by 240 minutes per week and replacing it with physical activity increased scores on standardized math tests. Traditional physical education, with its team sports orientation, often has students standing around or sitting and waiting for much of the time. A study conducted by Coe et al. (2006) found that on average, among a number of physical education classes studied, students participated in just 19 minutes of vigorous physical activity per class. Many students dislike team sports or find exercising with others stressful. Those who are not natural athletes are often marginalized by traditional physical education approaches, and being forced to participate can cause some students to develop a lifelong aversion to all physical activity. Many students would be better served by providing opportunities to participate in solitary fitness activities of their choice that they would be willing to engage in on a daily basis. Ideally, the focus of physical education should be shifted from competition with others to achieving new personal bests, such as least amount of time taken to run a mile. A successful example of such a program is that created by physical education director Phil Lawler at Madison Junior High School (Naperville, Illinois). Students develop personal fitness goals and engage in a broad array of physical activities, some traditional and others more modern, such as rock climbing, playing Dance Dance Revolution, and using high-tech aerobic equipment that provides instant feedback. Participants wear heart monitors while exercising so that they know when they are working within their optimal aerobic zones. Standardized test scores in Titusville, Pennsylvania, previously on the low side, rose to approximately 17% to 18% higher than the national averages in reading and math respectively. There was a 67% reduction in suspensions and fewer students were placed on academic probation at Woodland Elementary School (Kansas City, Missouri). How Much Exercise Is Required for Cognitive Benefits? When people hear about the cognitive benefits of exercise, they naturally want to know how much exercise they need to do in order to achieve those benefits. According to Ratey (2008), just 10 minutes of rigorous physical activity in academic settings has been found to enhance both attention and problem-solving skills among children. However, longer workouts have been associated with greater benefits for young and old alike, particularly when there are additional problems that interfere with learning such as anxiety, depression, and attention disorders. Coe, D.P., Pivarnik, J.M., Womack, C.J., Reeves, M.J., & Malina, R.M. (2006). “Effect of Physical Education and Activity Levels on Academic Achievement in Children.” Medicine & Science in Sports & Exercise 38: 1515–19. Dwyer, T., Sallis, J.F., Blizzard, L., Lazarus, R., & Dean, K. (2001). “Relation of Academic Performance to Physical Activity and Fitness in Children.” Pediatric Exercise Science, 13: 225–237. Ratey, J.J. (2008). Spark: The Revolutionary New Science of Exercise and the Brain. New York, NY: Little, Brown and Company. Sattelmair, J., & Ratey, J.J. (2009). “Physically Active Play and Cognition: An Academic Matter?” Board of Trustees of the University of Illinois. Shephard, R. J. (1997). “Curricular Physical Activity and Academic Performance.” Pediatric Exercise Science 9: 113–26. Sigfusdottir, I.D., Kristjansson, A., & Allegrante, J.P. (2007). “Health Be­haviour and Academic Achievement in Icelandic School Children.” Health Education Research 22: 70–80. Sport Information Resource Centre (SIRC). (2009). 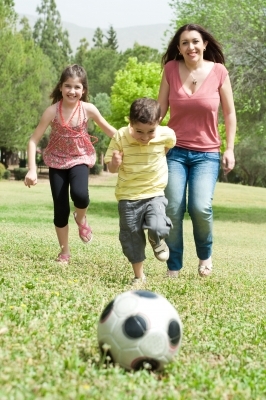 “Recommendations for Physical Activity, Mental Health Benefits of Exercise.” SIRC.ca. The Nemours Foundation. (2010). “Overweight and Obesity.” KidsHealth.org.